Delivery times may vary, see cgv contact us before the purchase to have the exact deadlines. By clicking on immediate purchase, the customer certifies having read and accepted the general conditions of sale! Available at the bottom of this. Kit 2 double power cams. This product is compatible with the following models. T-max 500 4t lc inject (from 2008). T-max 500 4t lc inject. The camshaft is the most important part of the 4-stroke engine at the timing. The camshafts are responsible for the management of the opening and closing of the admission valves for the supply of the combustion chamber and the opening and closing of the exhaust valves for the combustion chamber. The dual power cam malossi have been developed to obtain an optimal and progressive power increase if they are mounted to malossi pistons with high compression for the original cylinder or exponentially if they are mounted on the twin cylinder 560cc malossi . Malossi has thought of both carbureted vehicles and injection vehicles: each model, first or second series, can boast, indeed, a significant power gain if they are mounted with double power cam malossi. The dual power cam malossi are the result of a long and meticulous project in our test room. The process of industrial production scrupulously followed the specifications imposed by the technical department. From the choice of materials through the use of the latest generation of cnc with very high precision, thermochemical treatments and finally, testing adjustments and assemblies. A company that has always been at the service of high quality. Camshaft controlling the exhaust valves. Camshaft controlling the intake valves. Superlinked steel, hardened, hardened, nitrided and rectified with lobes recalculated, increased and profiled. Misterbike declines any responsibility concerning a development of the vehicle which modifies the characteristics of speed. In case the said modification would be contrary to the laws in force in the country of the end user. The processing time of your order can vary 5 to 15 working days, contact us before the purchase !! anti-theft devices, batteries, spark plugs, chain kits, pinions, crowns, chains, clutch discs, air filters,, oil filters, fuel filters, oils, engine gaskets, spinnaker seals, brake levers and clutch grips, handles, jaws brake, fixed and floating brake discs, brake pads, motorcycle tires, cross and enduro tires, scooter tires, quad tires, inner tubes, lamps and spotlights, wheel bearings and steering bearings, spraychain, turn signals, mirrors, fork tubes, cables, tank caps, handlebars, saddles, bolts, handlebars, valves and stoppers, contactors, workshop saddles, footrests, belts, exhausts, tools, top cases and windshields. Helmets, rain gear, clothing and anti-cold accessories, tire cover, etc. 03.25.55.74.71 Monday to Friday from 9h-12h to 14h-18h. 06.62.69.50.19. 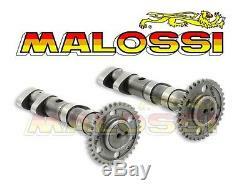 The item "power cam camshaft malossi yamaha tmax 530 t-max new 5915981" is on sale since Thursday, June 5, 2014. It is in the category "auto, motorcycle parts, accessories \ motorcycle parts \ other". The seller is "misterbike-fr" and is located in / at bettancourt la ferée. This item can be shipped to the following country: France.